There are people who look forward to eating a home cooked meal… at another person’s house. It’s like a surprise each time, you never know what to expect. Last February, my newly wedded cousin and her family invited us over to their home to get to know her new family. Her in-laws flew in from Mongolia to attend the wedding and explore a little bit of the Philippines as well. We discovered that the dinner fell under the same day as the Mongolian New Year called Tsagaan Sar, a celebration that marks the end of the harsh winter and the beginning of spring. To which the guests prepared a couple of dishes which they had been making since the previous day! We were very much excited. Snuff and salad. Killer combo. Before dinner was served, a brief introduction was given about certain customs such as manner of greeting friends and family and who takes charge of hosting for the entire clan. Most interestingly, a bottle of snuff was passed around the dinner table and we all tried some. Apparently it’s still common in Mongolia. The buuz and inside the buuz. Then the food was served. 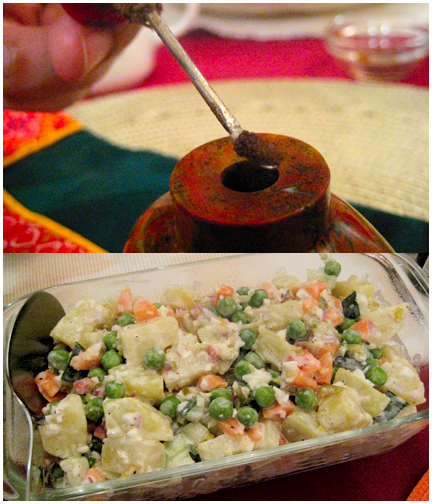 Dinner started with a potato salad with carrots, peas, onions and mayo. Simple, fresh ingredients to whet the appetite. The highlight of the meal was the Buuz; steamed dumplings filled with minced meat (usually mutton or beef), chopped onion and some salt. It is one of the main dishes served for this occasion; usually dipped in Maggi seasoning. Everything was made from scratch: from the finely hand chopped steaks to the dumpling wrapper. Leftover dough is usually dropped into some soup so nothing goes to waste. 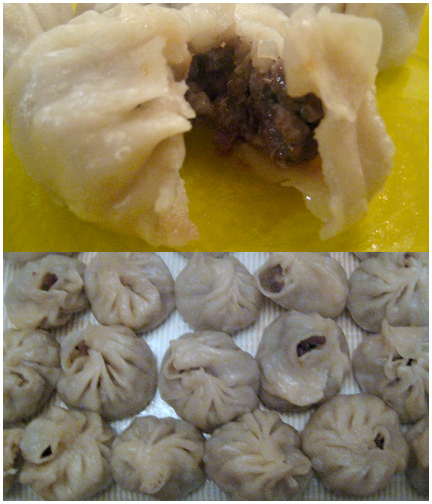 The dumplings were very meaty and juicy with the seasoning just adding a hint of flavor to the filling. Mongolians are very particular about how their food is prepared; they value the simplicity of a meal without sacrificing taste. At the end of the meal, some sweets were passed around. 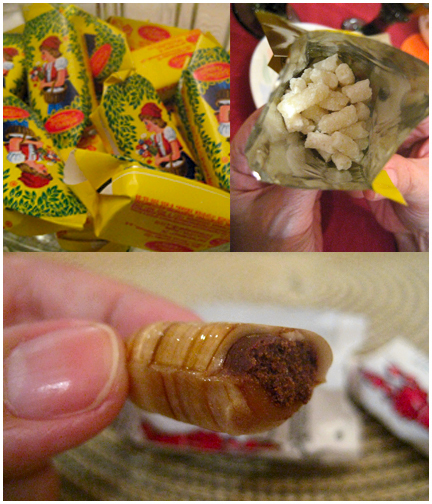 One, a popular Russian chocolate and the other was a hard candy with a soft chocolate center. Take note on how they wrap their sweets… very neatly folded! Another popular treat passed around the table were yogurt curds. It may be an acquired taste, a far cry from the frozen yogurt craze available here, but it was interesting to try yogurt in a dry pellet form. Cow’s milk was used for this product but they also produce curds from horse milk. Our dinner lasted for hours given that in between bites there were pieces of culture and history injected into our meal, but it was one of the most memorable meals I’ve had so far. The in laws hardly spoke English so my cousin’s hubby became our translator. We all did a lot of hand gestures communicating so that also definitely made it much more entertaining for everybody. At the end of the night, we had a group photo and the in-laws presented our family with a bottle of premium vodka. The precious bottle is still in special storage; it’s story yet to be made. You had me at pellet. So Long, Salamia. Hello, Mariko.